So while the Frog spent her Saturday selling all of her useless crap (that had been cluttering our storage unit for close to 18 months now) and Sunday in the city spending all of her new-found cash on shoes, I was working. 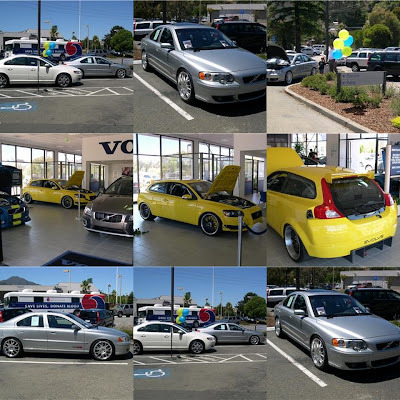 Volvo Marin, our local dealer, was holding a customer appreciation and brand awareness event. It was the perfect opportunity to introduce Evolve Cars (which has been my pet-project for the past 8 months) to the average Volvo consumer, who clearly has no idea that Volvos can also go fast or that there were companies out there that could help them make that happen. Indeed, to my surprise, everyone I spoke with was very excited about the opportunity to customize their Volvo and add some excitement to it. On display to showcase Evolve's expertise, we had my personal Evolved S60R, as well as our 500hp C30 showcar that we built for the SEMA show last year. If customer feedback is to believed then it all bodes well for the future of Evolve. Stay tuned for stories of champagne wishes and caviar dreams. WOW! Marin isn't the only thing that has evolved!! Welcome to the blog posting Peter - nicely done!